What to feed ACTIVE kids? I know I am not alone here when I say I have a very active child! Both my 9 year old son and his best mate are incredibly sporty and they both struggle sometimes to keep fueled sufficiently. It’s the kind of challenge I like though. It means I really get to see the reality and not just spout the theory. Young, active kids really do need to eat the right kinds of foods. Why? The first thing I explained to my son is that he must eat a range of brightly coloured vegetables and fruit daily if he wants to do really well in all the sports he does. He can tell anyone that asks why. He’ll tell you that if you do eat a range of veg and fruit you will have a really healthy and strong pacman who can go around eating up all the dots. The dots are the radicals (free radicals) that occur when you exercise. Too many radicals leads to illness or injury and that means no sport (boo!). Loads of veg and fruit means lots of antioxidants. They are what makes a strong pacman! 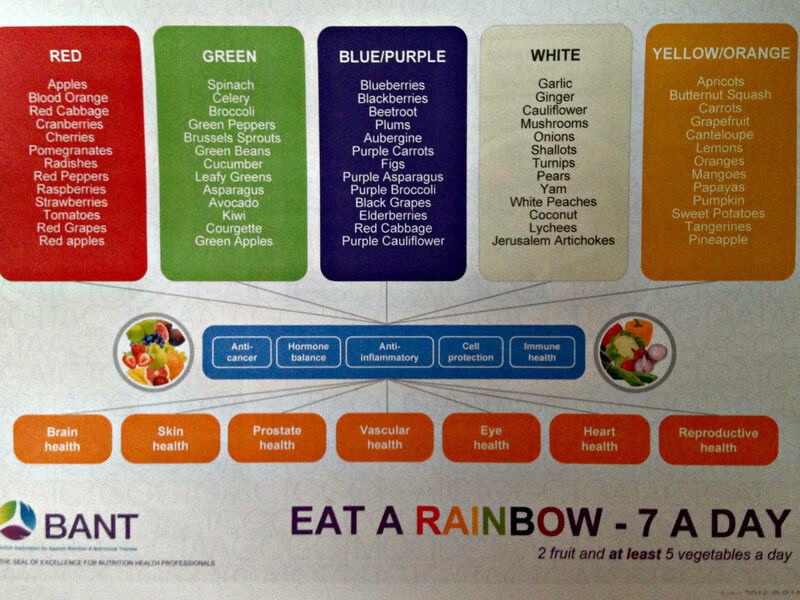 TOP TIP: Try to eat a rainbow of vegetables and fruit every day. You can use charts to achieve this but they may be less keen on this kind of incentive as they get older. Simply having a poster on the wall or some print outs can help. We use this one. The word protein is derived from the Greek word ‘proteos’ meaning “of prime importance”. When it comes to those exercising a lot on a regular basis they really do need to think about the frequency and quality of protein intake. Proteins are not easily stored in the body so they do need to be consumed on a frequent basis – I’d suggest at every meal. Also the quality is important as there are 9 essential amino acids (the building blocks of protein) that we do not make ourselves and therefore do need to consume. Furthermore, active kiddies use protein mainly to repair and rebuild muscle that is broken down during exercise and to help the body store energy in the form of glycogen. You can see how important it is to active kids so where can they find quality proteins? TOP TIP: Ensure your active child eats meat, dairy, eggs, poultry and seafood daily. We all know that carbohydrates provide energy but which kinds of carbohydrates work for which people and when is a very personal thing. I’d suggest that many people consume too many refined and processed grains in their diet. Many can benefit from switching those processed and refined grains for more natural sources of carbohydrate i.e. those without an ingredients list – think potatoes, root veg, rice, quinoa, buckwheat, spelt pasta etc. The timing of carbohydrates really does come down to the individual. I’ve worked with very active children and teens who simply cannot digest wholegrains near to activities. They tend to rely more on simple carbs near to an event, those that are easily and quickly digested and provide almost instant energy. With my own son we try and steer clear of all processed grains prior to matches. It’s not always easy but digestively and from an energy perspective that seems to work best for him. TOP TIP: Try and work out the best nutritional strategy for your child, especially where rates of digestion are involved, away from competitions and matches. It’s best to make the nutritional mistakes around training sessions when there is less at stake. Trying to get your active child to drink enough when playing sport or when competing at dance for example can be really though. The way I “sell” the benefits to my children are based on performance. A well used stat is this one “if you are only 1% dehydrated you will likely have a 5% drop in concentration”. Now place that in the context of your child’s activity i.e. “imagine missing the goal by 2cm”, “imagine delivering a perfect dance routine but tumbling on the last leap”. TOP TIP: buy your child a decent (metal and insulated) water bottle. That way the water tastes good, keeps cool and the bottle is hygienic to use and reuse. Use ice and even veg or fruit to add interest to the water. Cucumber or lemon slices are often well received.